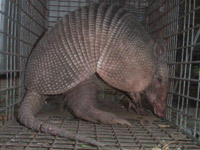 A young armadillo caught by hand. 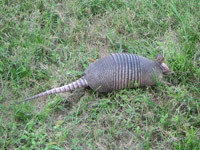 Another juvenile armadillo. 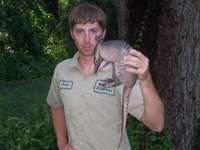 An adult armadillo is tough to hold. We caught these two at the same place. It takes experience to catch them. It can curl, but not into a ball. You can observe the soft belly. 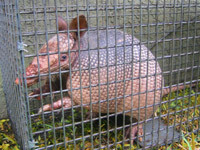 Armadillo closeup in a cage trap. 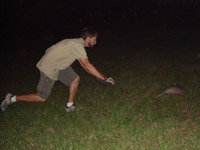 Armadillo running in a field. 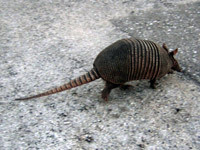 Dillo scurrying on the pavement. 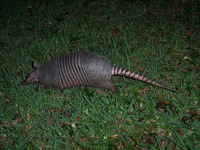 A nighttime armadillo photo. This is how they dig for food. 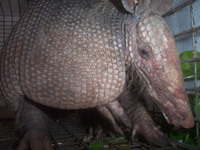 Florida armadillo closeup. Here's one climbing on rocks. Notice the wound on this guy's back. 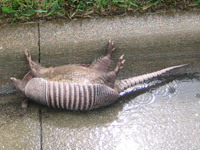 The armadillo was hit by a car. 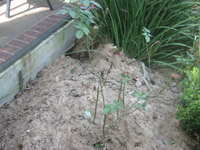 Large amount of sand outside a dillo hole. 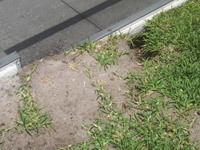 A burrow dug right next to a house. 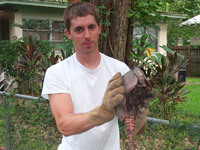 This armadillo dug under the pool deck. 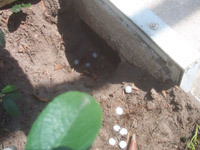 Homeowners tried mothballs to no avail. A shot from beneath - the dillo's snout. 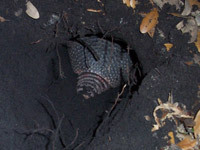 Armadillo in the act of digging a burrow. 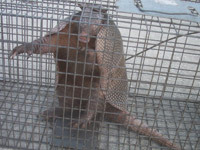 Four armadillos caught in one day. 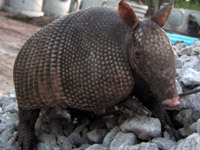 I'll never rest until every dillo is caught! 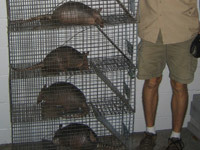 I have more pictures of armadillos and armadillo images and information on my armadillo removal pages. 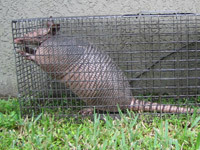 Dillos are very interesting looking animals, and they have many unique traits. People like the nine banded bony shell that they wear for armor. 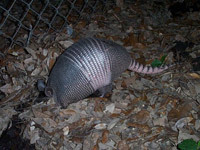 Armadillos have an armored tail as well. They have a small head with tiny eyes and a little mouth like an anteater. 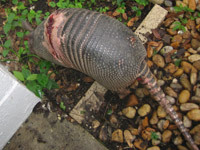 People ask me if armadillos can bite, but they can't. 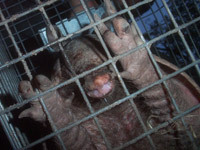 They have tiny pegs for teeth, and only eat small insects and invertebrates like grubs and worms. 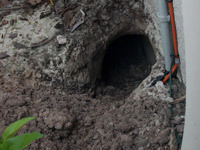 The only real trouble that they cause is the digging. They're neat animals! 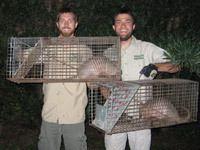 AAAnimal Control is a privately owned wildlife removal and pest control business, located in Orlando Florida. I deal strictly with wild animals. 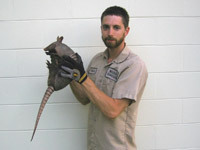 I am not an extermination company, but a critter removal and control specialist. The above photos are some of the many that I've taken in the field over my years of work. Please email me if you have any questions about the above photographs.